Make your mornings a whole lot sweeter with honey and these Flap Jack’s Peanut Stacks. 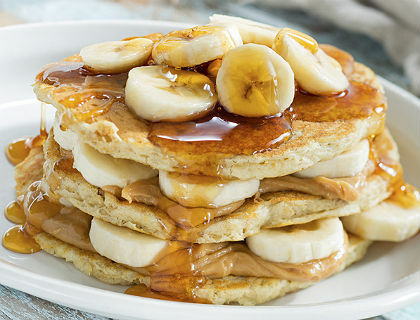 Filled with hearty ingredients like peanut butter and oats and naturally sweetened with honey, these pancakes have everything needed to power through the day! In small bowl, combine peanut butter and 1/3 cup honey; mix well. Set aside. 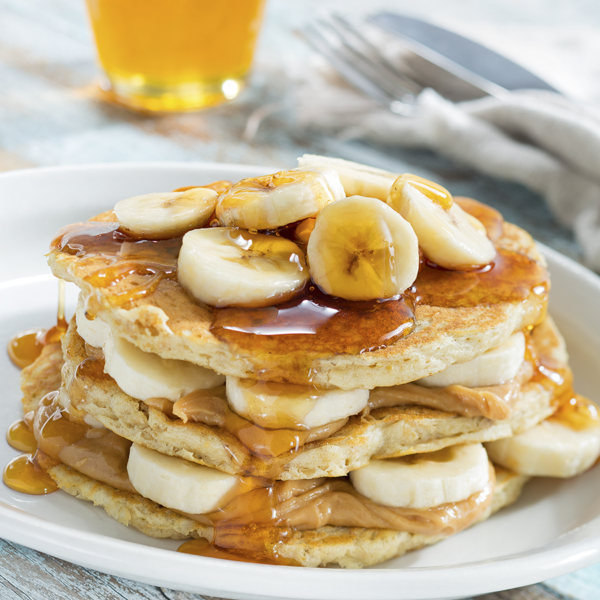 To serve, place one pancake on plate; spread with 2 Tablespoons peanut butter/honey mixture and top with additional 4 to 6 banana slices. Repeat with remaining pancakes making stacks of two. Drizzle with honey, if desired. *Substitute soy nut butter for peanut butter in spread. * Extra pancakes can be frozen up to 1 month. Cool completely, then stack with waxed paper between cakes. Transfer to freezer bag or airtight container and seal. To reheat, arrange 2 pancakes on microwave-safe plate. Microwave at medium (50%) until heated through. * Store peanut butter spread covered at room temperature up to 3 days.